I had a lot to say, but it feels like all the words I was going to use to describe my wonderful weekend at the Knitter’s Review Retreat were lost to a crazy work week. Photos will have to do (there are more in my Retreat Set on Flickr), and I can ramble, I suppose. Here goes. After all my fussing and fretting about getting packed and leaving on time, I managed, thanks in part to a bonus afternoon off on Wednesday. 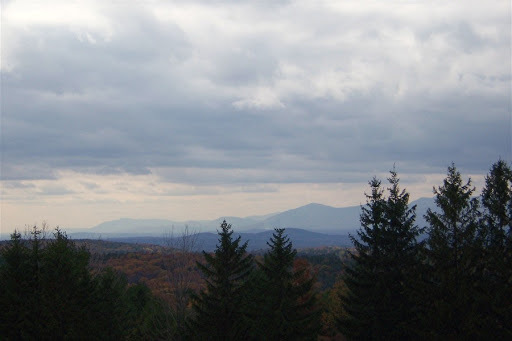 It was cloudy and only a bit chilly on Thursday, and the drive to the Seven Hills Inn took about four and a half hours. The Inn was comfortable and cozy, and who can resist a bed with six pillows? On Thursday evening the early arrivals had a nice dinner, a good visit, and lots of laughter. Then Friday morning arrived, and we spent a few hours learning how to knit in the Swedish Bohus tradition with Shelia January. I’d never done colorwork before, at least not successfully, so I’m thrilled that I got off to a good start on my little headband. The rest of the knitters arrived on Friday afternoon, and the fun and the decibel levels went through the roof. We knitted, we talked, we ate, we showed our stuff, and it was way after midnight before my head hit the (many) pillows. I spent Saturday afternoon assisting Ms. Clara at her table in the Retreat Marketplace, visiting with friends, and having an all-around good time. Saturday night there was more knitting and fun (and cake!) in the big ballroom. On Sunday morning, after another late night on Saturday, we gathered for my favorite part of the Retreat — we read the letters we’d written to ourselves last year (I didn’t cry this time), wrote a new letter that we sealed and gave to Clara, and began our New Beginnings project. Mine is the Diamonds and Pearls shawl from Clara’s book, designed by Shelia. 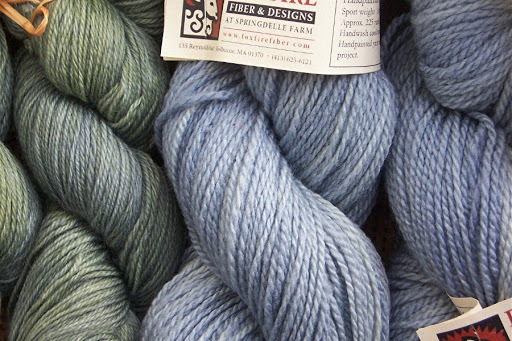 I’m using some beautiful silk/merino from Spirit Trail Fiberworks, chosen for me by Purlewe on Saturday afternoon. The weekend was too short. I was just getting going, just beginning to settle in with my dear friends for a visit (hey Martha! ), just about to forget my daily life. I need more of this, these connections to the people and the knitting and the creative energy. I even stayed an extra night — to keep from having to drive home late at night, of course, but also to prolong the goodness. Clara puts together quite a magical weekend. I wish I could describe it better, tell you just how much it means to me to be in that place with those dear people, and give you a real sense of it. Words fail. Now that I’ve been home for almost a week, and life has returned to what passes for normal (normal does not really exist for a bookseller in the week leading up to Thanksgiving), I’m in a quandary. What to work on? Should it be Cormo? How about silk and merino instead? Silk and merino! Yummy.Sounds like a magical break. Hopefully you can hold on to a little of that throughout the crazy holiday bookselling season. 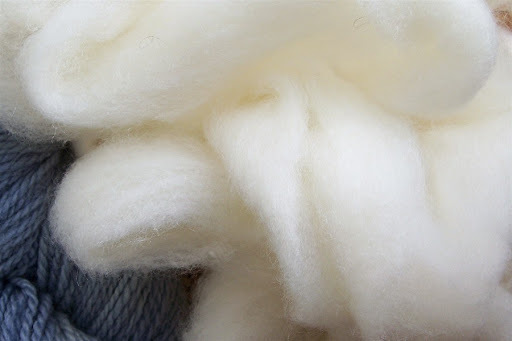 definitely silk/merino… makes me want to touch it just from the photo :-)how great a weekend you all had. – everyone’s blogs look wonderful about it. Really who CAN resist a bed with six pillows? Not I!LOVE the quilt of knitters’ hands. That’s beautiful, really something. Glad you had a good time. Love the knitters’ hands.I vote for Silk and merino! 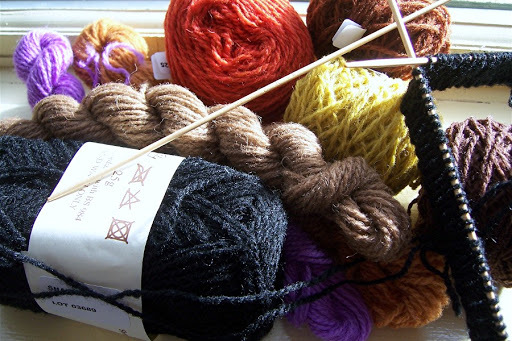 you sound like you really enjoyed and needed the break from all things work, how did the bohus workshop go, the colours in those kits are just amazing – did you sucumb? 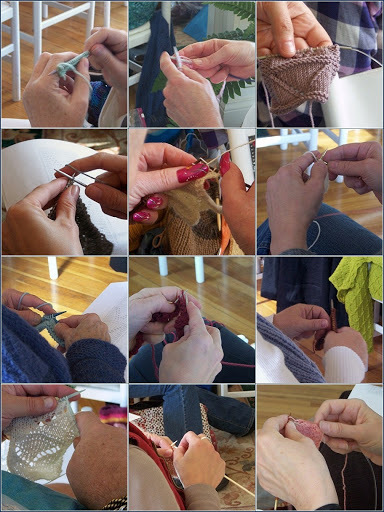 I love the knitters’ hands collage. It’s good that you had such a wonderful break before the holiday shopping season. It was so nice to meet you in “real life,” Jane! Reading your blog and seeing the pictures makes me smile and remember that glorious weekend. Now I have to go take a walk through my stash and find something new to cast on. 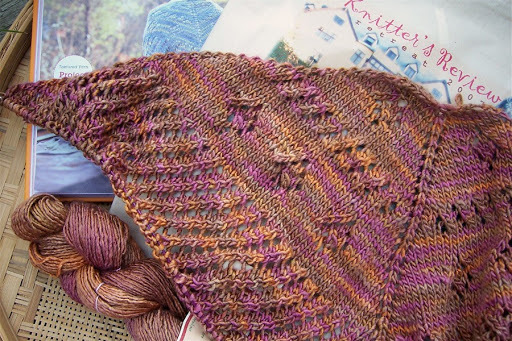 That shawl is looking awesome.Very inspirational. I want to go to the next retreat! With Seasocks looming I think I might have to wait for the KR retreat for 2009 and remember to not talk about it so I can sneak in yet another knitting vacation for me and the missus.